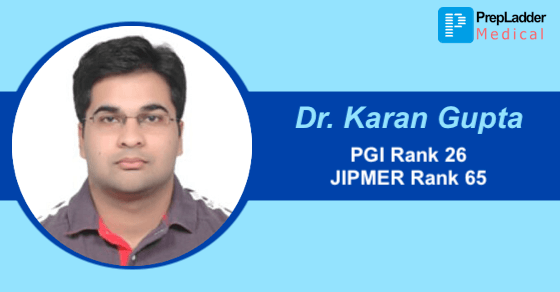 PrepLadder boasts of its alumni Dr. Karan Gupta for securing Rank 26 in PGI and Rank 65 in JIPMER. We congratulate him and wish him best wishes for many successful years ahead in his career. In this exclusive interview with PrepLadder, he unveils his plan of how he managed to grab such a great achievement and shares some tips so that you too can get your desired seat. What do you think is the correct approach to study for PG entrance exams? Only MCQ's or Theory + MCQ's ? Dr. Karan: I strongly believe that both theory and MCQs are important as they are the 2 pillars to succeed in any PG exam. Especially for PGI, going through previous year papers and practicing papers as much as you can is must to get a good rank. Dr. Karan: According to me, ideal time to start the preparation would be Pre final year where you need to be focused and hence achieve what you desire. Central Institute exams particularly focus on content from standard textbooks like Ganong, Robbins, Harrison, Bailey and Love, hence these books should be read thoroughly. Dr. Karan: Yes, this was my third attempt. Earlier, I took many exams in 2016 and in 2017 as well, like: December, 2016- AIIMS-5500, PGI-4500, JIPMER-1900, NEET-14000, May, 2017-AIIMS-387, PGI-95, JIPMER-332, November, 2017- AIIMS-531 and then finally PGI-26 and JIPMER-65. During all this time, I realized the importance of practicing. So, I joined PrepLadder’s test series and practiced as much as I could and the consequences are relishing. How big is the role of practice and revision while preparing for PG entrance and how much time should be dedicated for it? Dr. Karan: More is the amount of Practice + Revision, better will be the results. Going through and practicing previous year questions is very important to know the pattern of exam and to know the most asked topics in that particular exam. PrepLadder practice papers helped me a lot in achieving this feat. I got to know my level among higher number of competitors. I would highly suggest every PG aspirant to revise the entire prepared material atleast 3 times. Go selective for the particular exam in last few days before the exam to be extra sure of your success in that particular exam. Did PrepLadder play a part in your success? If yes, how ? Dr. Karan: Yes, PrepLadder surely played a major role in my success. Through Prepladder practice papers, I got to know about my weak areas and topics which I had to focus while going through my notes. The best part about PrepLadder tests is the improvement plan you get at the end that helped me alot. And I also got to know where I stand with my preparation among many other PG aspirants. Dr. Karan: I had a habit of making study plans in order to avoid anxiety but I couldn't follow them. However, making a plan really kept me going and helped me to focus better on notes. Dr. Karan: Undoubtedly, I was a mediocre one. Dr. Karan: I had difficulty in retaining Anatomy and was pretty comfortable in other subjects. I found pathology very easy and interesting. Mistakes that you believe everyone must avoid while preparing for PG entrance exams. 1) Don’t read any content or material just once. Make sure to recall and revise what you study in order to get the rank. 2) Another mistake that few people tend to commit is to read same topic from different sources but they don’t revise it. Instead, it is better to stick to any single source and revise it multiple times. 3) Mismanagement of time can pull you back from grabbing a good rank in any exam. Thus, Practicing MCQ with clock ticking by side is important as it conditions the mind to avoid the silly mistakes in the Final exam. Allot separate hours in time table for practicing test papers. 4) Don't read anything new in last 15 days before the exam that will only confuse you in the exam. How many options did you attempt in PGI exam? Share some details about your exam taking strategy. Dr. Karan: I attempted around 550 options in PGI exam. According to what I analyzed from previous year PGI papers, 620-650 options are correct out of total 1250 options. Doing fewer negatives is really important in PGI exam as it affects your overall rank. Only mark the option in case you are more than 50% sure that it is the correct one. Dr. Karan: Set a target before starting your PG preparation. Go through some success as well as failure stories so that you have a crux of what to do and what not to do while preparing for your exam and thus make a broad plan accordingly. Most importantly, have faith in yourself, stay motivated and put all your efforts for your sure shot success. Focus, determination, perseverance are really important for any PG aspirant. If I can achieve this, so can you. Hope this blog will help you in your preparation for your exam. Just remember, never lose hope and keep practicing with a positive attitude. You will also surely achieve what you desire.